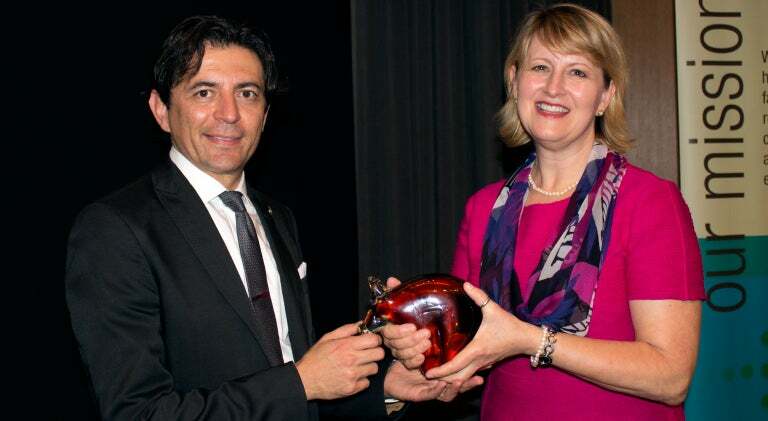 Simón Barquera, MD, PhD, a Friedman School alumnus (N96, NG05) was honored at the 11th annual Michael and Susan Dell Lectureship in Child Health on April 6. Hosted by the Michael & Susan Dell Center for Healthy Living at The University of Texas Health Science Center at Houston School of Public Health in Austin, the lectureship recognizes distinguished researchers who have made outstanding contributions to child health. Barquera, Director of the Nutrition Policy Research Division of the National Institute of Public Health of Mexico, delivered the keynote address, speaking about his work to combat the growing threat of diabetes and obesity in Mexico. His research findings led the country to impose a tax on soda to reduce its consumption and enact healthy food policies. Barquera is the associate editor of the journal Public Health Nutrition and is an active member of several organizations including the Ministry of Health Chronic Diseases advisory board, Pan American Health Organization Expert Group on Sodium Reduction, World Obesity Federation Scientific Advisory Board, and Obesity Society. Pictured (from left): Simón Barquera, MD, PhD, and Deanna Hoelscher, PhD, RD, director of the MS Dell Center for Healthy Living.